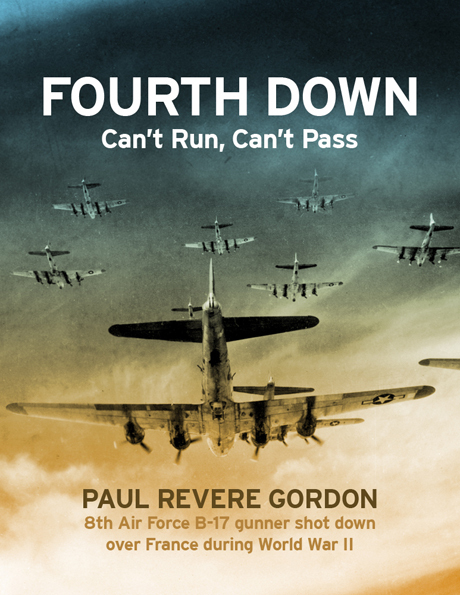 Sergeant Paul R. Gordon served with the 8th Air Force as a B-17 ball turret gunner during World War II. On his fourth mission, his bomber was overwhelmed and destroyed at the hands of the Luftwaffe. Seriously wounded and alone in occupied France, Paul was given shelter in the town of Mouchin before being discovered by the Germans. He spent the next two and a half years as a prisoner, surviving harsh treatment and poor living conditions in a series of P.O.W. camps, including Stalag Luft III, Stalag Luft I, Stalag VII-A, and Stalag XVII-B. Throughout his ordeal, he maintained an uplifting spirit and a sense of humor that helped him endure when others could not. Paul’s is an inspiring story of survival and perseverance. Featuring supplemental articles, documents, and photographs, his book takes you on a first-hand journey from his capture in 1942 to his return to Mouchin fifty years later. Paul Revere Gordon was born in Cressona, Pennsylvania in 1920. After spending his high school years as a coal bootlegger, he followed his love for airplanes by enlisting in the Army Air Force. Assigned to a B-17 “Flying Fortress” crew, he was shot down over France in October 1942 and remained a prisoner of war for thirty months. He maintained a lifetime friendship with the French citizens who cared for him after his bomber’s crash and has revisited them in recent years. He currently resides in Berks County, ­Pennsylvania.